It was a sunny Sunday and we had plans to meet my in-laws for brunch. I know it’s a long drive for them all the way into the city so I suggested a compromise. Push it back to lunch and we can meet at In Riva, just off Kelly Drive. My father-in-law, a pizza aficionado, was happy to oblige. What the cycling fanatic didn’t know was that In Riva is not only bike and runner friendly but a cycling theme throughout. We decided that we would embrace the gorgeous day. My husband rode his bike to the restaurant, while I left a little early and went for a run along the drive. We met at In Riva at 11am where I gave my husband a tongue-lashing for opting to wear his cycling shorts to lunch. I was wearing my running pants though. Double standard? We stepped inside and admired the myriad framed cycling print that decorated the wall. We were offered a seat on the patio overlooking the water and eagerly obliged. We settled down and took a look at the menu. Surrounding the patio were old bicycles adorned with lights. I, however, was ogling the menu. There was an intriguing salumi and formaggi menu, including a wild boar cacciatorini, and a variety of cheeses. I liked the option of “the mix” where you can get two salumi and two formaggi for $16. However, we had our eyes on the pizza. Between the four of us, we ordered a pizza each and one antipasto and a salad. My husband was yearning for some green veggies so he had the chopped salad and I just couldn’t leave without ordering the carciofi fritti (fried artichokes.) The waiter said he’d put in the antipasti and salad orders first so our food would be well-timed. The salad came out first. 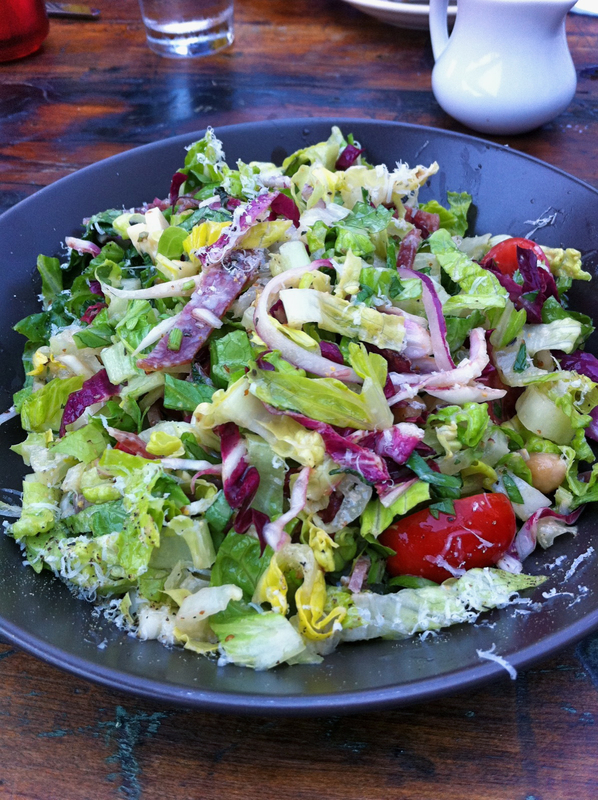 With salami, provolone and ceci, it was a crisp and refreshing salad with hints of Italy. The carciofi fritti arrived next, followed closely by my in-laws’ pizzas. 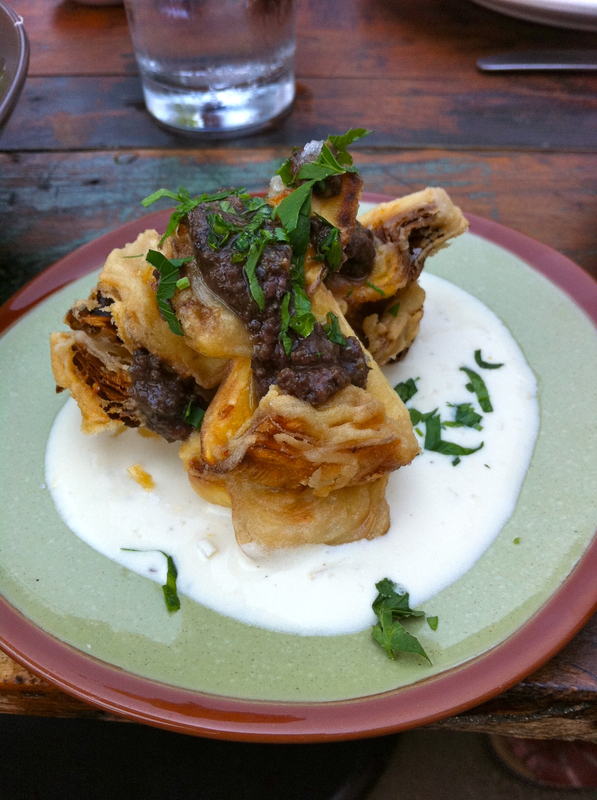 The fried artichokes were actually less flavorful than I had anticipated, although the lemony yogurt was the perfect balance. Check out my father-in-law’s pepperoni pizza. He’s a traditionalist when it comes to pizza and I was glad they had an option for pepperoni. And check out the pepperoni–they certainly didn’t skimp on it! 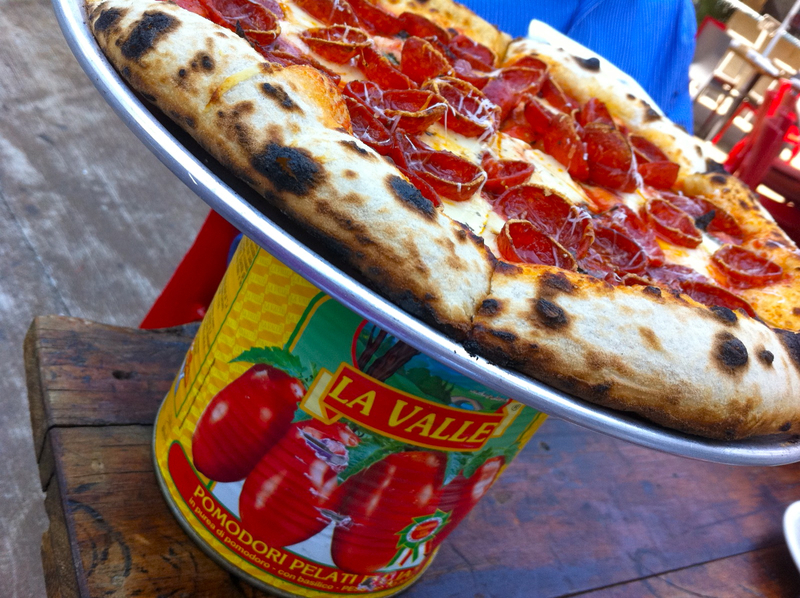 I love the idea of perching the pizza atop the La Valle tomato can. Unfortunately, the lag time between dishes was just a little too long and my in-laws were nearly done their pizzas by the time ours arrived. Have no fear, these pizzas were worth the wait! 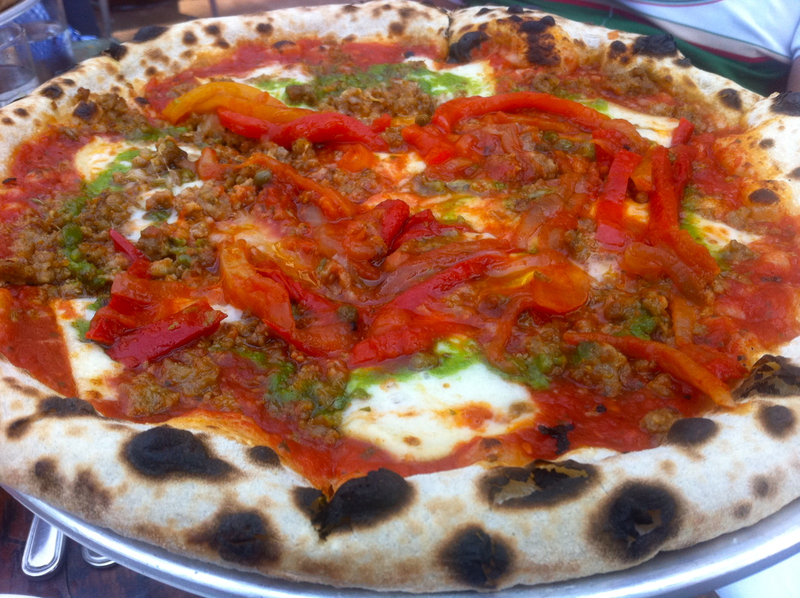 Having decided to go with a red and a white pie, our red option was sausage and peppers with pepperonata and fennel. Look at the beautifully charred crust. Perfect to munch on and wipe up the bits that spill onto the plate. The sausage was full-flavored with the perfect touch of fennel. The roasted peppers were the ideal partner to the tomato sauce with just a touch of mozzarella. Although it looks heavy, this was actually a light pizza, if there is such a thing. 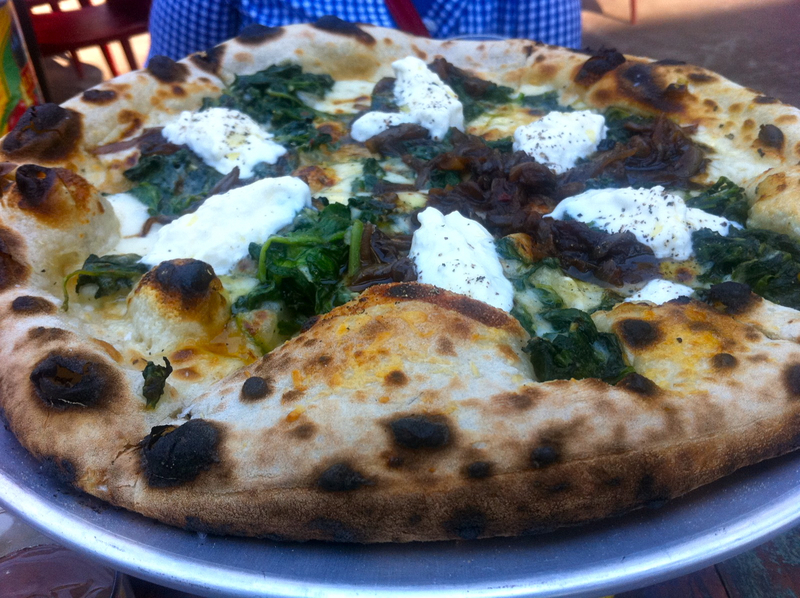 When I saw a burrata pizza on the menu, it immediately beckoned. Then I kept reading and saw garlic spinach and balsamic onions. Balsamic onions? You had me at hello. The server explained that the pizza was actually cooked without the burrata, which would be added after it came out of the oven. In Riva is a great option for lunch after an AM workout. The staff is friendly, the deck is relaxing and…SPANDEX ARE OK! As it turns out, my husband was NOT the only guy in there rocking his spandex. While it’s a little out of the way for me, I’d love to check them out for happy hour. They have a nice-looking Italian beer list and I can only imagine that deck on a cool summer evening. Great review!! I’ve had my eye on this place to stop at during a bike ride too, so I’m glad for your spandex validation. Will have to get there this summer. Pizza crust looks AWESOME. i’ve been wanting to go here! it looks good. That pepporini pizza sure looks good! I am bringing Brian here!